Convenience feeding was born from just that...convenience and ease of feeding. But is your horse really being fed optimally? All horses have different energy requirements but their nutritional needs are very similar. When you combine nutrients with energy they become dependant on each other. Poor doers often get overfed nutrients and good doers are often not getting what they need. The only exception to this rule is selenium which is often incuded in high amounts. Why is this? If you think about it, feed companies have to try to cater for horses receiving each end of the feed range eg 500g-1kg of feed or 4-6kg of feed. So nutrient levels generally have to be low so not to be dangerous to those horses receiving the full recommended amount or slightly more, of feed. It is a better approach to separate the energy and nutrient content. Then it is possible to supplement each horse with what they require each day and vary the feed component according to condition and other variables. This gets the absolute best result and in most cases is also cheaper! We also strongly advocate feeding simply and in harmony with how your horse naturally digests, rather than feeding fast food modern feeds high in protein and sugar. Keeping it simple, but using supplementation unmatched for its safety, absorbtion and quality. Our supplementation is quite simply unique in the marketplace from a scientific perspective. Pure organic proteinate minerals, probiotics and other functional nutrients ensure a level of nutritional support unparalleled. We want our horses to last a long time, especially when we often spend years training them, and many are considered our family. A high protein diet is an inflammatory diet. Protein is 6 times more heating than a carbohydrate and over time can lead to arthritis, unsoundness, skin problems and a myriad of issues. Too much sugar fermenting in the hind gut also causes our horses much distress. Horses were never designed to ferment high protein or sugar feeds, they were mean to ferment fibre, in contrast, cows are designed to ferment protein. This has remained unchanged for thousands of years. The by product of fermenting protein and sugar causes many of the common issues horses deal with today. Back to Basics and Simple is Best! HOW DO I FEED MORE SIMPLY? We are often asked what to feed by our customers. There are many choices for the customer who wants to feed more simply. As a rough guide we say chose a chaff/fibre element, a short chain fibre element and an energy element. A small amount of oil is optional. 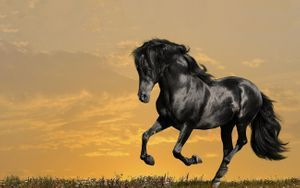 The kind of energy fed will depend largely on the temperament of the horse. A more sensitive hotter horse will be better on a cooler fuel such as rice bran or a rice bran nut or high fat option, and a less sensitive horse needing energy will be better on an extruded or cooked grain. *Please note that feeding a small amount of oil is great for the coat but it ineffective as an energy source as not enough can be fed safely to make a difference. Also claims regarding the steroid effect of rice bran oil are completely false as the concentration is far too low to have a therapeutic effect, although is an excellent choice health wise. Another example of the marketing wheels at work! 1- FIBRE ELEMENT - eg Meadow, Lucerne, oaten chaff or chaffage (please note the protein level of chaffage will be excessive for most grass fed horses). If you have a horse not getting any protein from grass it is useful to add chaffage or Lucerne here. 2- SHORT CHAIN FIBRE ELEMENT - Soaked beet, or soy hulls. If you do not wish to feed this element and have a stabled horse, then increase the Fibre element of the feed. 3- ENERGY ELEMENT - This element can be dropped for a good doer not requiring extra energy. eg. Extruded, or cooked grain. Rice bran pellet. Small to moderate amounts of crushed grain is ok for outside horses getting grass and constant fibre and those not working. Uncooked or unprocessed grain finds its way to the hind gut where it is fermented. This produces an acidic environment which compromises digestion, muscle function and other body processes as well as killing off friendly bacteria in the gut. Processed grains and rice are digested before reaching the hind gut. The only food which is safely fermented without negative side effects is fibre. 4- Nutrition - Your Elite Equine Nutrition foundation formula of choice. NOTE REGARDING PROTEIN - If your horse is paddock kept he will be getting plenty of protein via grass. Extra protein is advised in situations where the horse does not have access to grass. Most grasses range from 15-30% protein. If its green it will be at the higher side of this range. Dry summer grass is around 15%. Horses require between 9-16% depending on age and activity. High protein feeds are expensive, unnecessary and not only stress the kidneys and other excretory organs getting rid of the excess, but is an inefficient energy source since protein is not utilized as energy well. Excess protein can also be dangerous for older horses. If your grass quality is poor you can add a small dose of Mega Build to make sure no amino acids are lacking from the diet and the horse can utilize the protein he is eating fully.